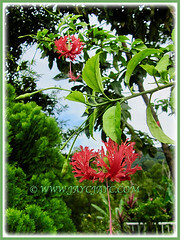 Grow Hibiscus schizopetalus or Japanese Lantern that produces showy and unique lantern-shaped flowers. Plant it too as it is a magnet to a variety of pollinators including hummingbirds, bees and butterflies! An easily grown, free-flowering tropical plant that will definitely be a conversation piece! 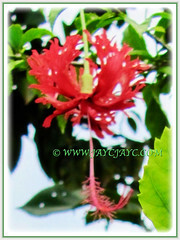 Botanical Name: Hibiscus schizopetalus (syn. : Hibiscus rosa-sinensis var. schizopetalus). 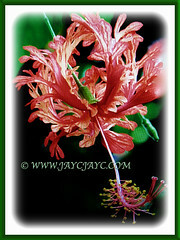 Common Names: Japanese Lantern, Japaneses Hibiscus, Fringed Rosemallow, Coral Hibiscus, Spider Hibiscus. Etymology: The generic name is the old Greek and Latin name for mallow. The specific epithet schizo meaning split and petalus meaning petal is in reference to the recurved and divided petals of each flower. Origin: Native to tropical eastern Africa in Kenya, Tanzania and Mozambique. It is also cultivated worldwide. 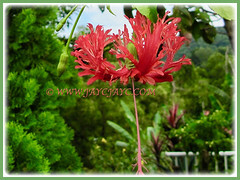 Features: Hibiscus schizopetalus is a species of the genus Hibiscus that comprises of over several hundred species of flowering plants. A rapid grower, it typically grows as a narrow, woody and evergreen shrub or small tree to about 3 m in height. Although it is not native to Japan, its flowers droop from the branching in a manner reminiscent of Japanese lanterns, hence the common name. Its upright-arching stems are clad with ovate, serrate, dark green leaves up to 12.7 cm in length. Each leaf is borne on a short petiole. It produces five-petaled, lantern-like flowers up 7.6 cm across and bloom seasonally on long pedicels. The flowers are produced singly from leaf axils on upper stems. Each showy flower features recurved, fringed and a long slender pendent staminal column. Each column is longer than the corolla (up to 4″ long) with a 5-branched style and anthers near the upward-curving tip. The captivating flowers are very distinctive in their frilly and finely divided petals. The flowers have finely dissected petal and comes in a range of colours, such as red, orangy-red and pink, the most common being the red form. 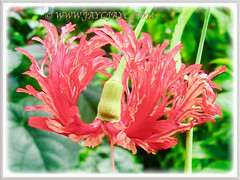 It is also commonly called Fringed Hibiscus or Fringed Rosemallow in reference to its irregularly fringed petals. If pollinated, the flowers may be followed by oblong seed capsules. 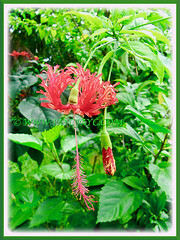 Culture (Care): Hibiscus schizopetalus or Fringed Rosemallow can be easily grown with minimum care. Moisture: Moderate water requirements. Water thoroughly to moisten the entire root-ball each time you water. Allow the soil to become slightly dry between waterings. However, never keep the soil soggy. Intolerant of drought. Soil: Best in well-drained, fertile, loamy and mildly acidic soils. Others: You may want to prune to keep it low, tidy and maintain a compact shape. Can be trained as a tree standard too. Pruning also helps to keep an abundance of flowers since flowers are formed on new wood. Generally free from serious disease or insect. However, do watch out for aphids, mealybugs and thrips. Poor lighting, temperature fluctuations, low humidity and irregular watering can cause buds to drop. For subtropical and temperate regions: Hardiness: USDA Zone 10 to 11. Where winter hardy, grow Hibiscus schizopetalus or Japanese Lantern as a specimen plant. In areas subject to frost, plants should be grown in containers and brought indoors before first fall frost for overwintering indoors in sunny areas with cool evening temperatures or treated as annuals. Container-grown plants will require daily watering during the warm summer months but much less when indoors with less light and cooler temperatures. Although the plant may survive a light freeze, it will lose all its leaves. Indoor plants need regular pruning to maintain a compact shape. Propagation: By semi-hardwood cuttings or by layering. Cuttings root easily when treated with rooting hormone and kept in humid conditions. 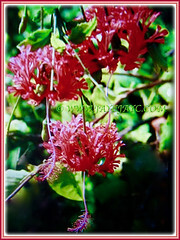 Usage: Hibiscus schizopetalus or Japanese Lantern are widely cultivated as a garden ornamental. Excellent to be used as a landscape shrub too. 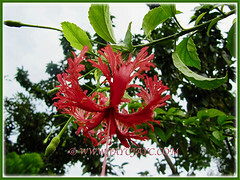 Hibiscus schizopetalus will stand out as a great specimen plant in any garden. Ideal to be grown in a large tub or container. If you’re a nature lover, grow it to attracts bees, butterflies and hummingbirds.